Analysis: Boswell is due a $2 million roster bonus in March, so if he sticks around through the offseason to actually "have competition," he'd probably have a long leash entering the preseason. The hope is that Boswell can return to his 2017 Pro Bowl form. Analysis: His 65 percent success rate on field-goals was the lowest in the league among kickers with 20 or more attempts, and well below his career average of 89.5 percent entering the season. Boswell was signed to a hefty long-term contact after last season -- with over $7 million guaranteed -- so, despite his awful season, there is a strong chance he will be back kicking for Pittsburgh in 2019. Analysis: Boswell was nearly replaced following Week 15 after missing his seventh field-goal attempt of the season, but he responded by not missing a kick last week against the Saints. The 27-year-old was never listed on the injury report, so what he's actually dealing with is currently unclear. Pittsburgh signed Matt McCrane to handle kicking duties as the team heads into the final game of the regular season. 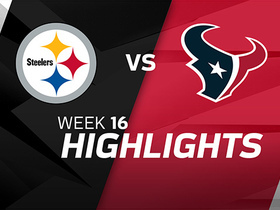 Analysis: This was a rare perfect game for Boswell, who was waiting for an opportunity to attempt a potential game-tying field-goal, but he never got the chance when JuJu Smith-Schuster fumbled at the New Orleans 34-yard line with 41 seconds to play. Boswell was also perfect -- making both field-goal and both PATs -- earlier this season against Week 17 opponent Cincinnati, which allows the most fantasy points to kickers per game (8.9). Boswell made both of his extra-point attempts and one of two field-goals (48) during Sunday's 17-10 win over New England. 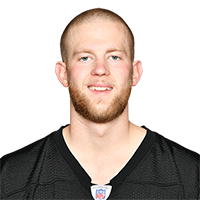 Analysis: The Steelers held an open tryout earlier in the week and may want to reconsider their decision to retain Boswell's services after he missed his seventh field goal attempt of the season. Head coach Mike Tomlin gave Boswell a vote of confidence following the contest, but New Orleans allows the fewest fantasy points per game to kickers (5.0), so it is advisable to look elsewhere regardless of who is kicking for Pittsburgh in Week 16. 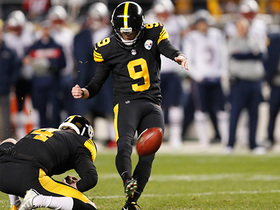 Boswell will remain the Steelers' kicker for the team's Week 15 matchup with the Patriots, Jeremy Fowler of ESPN.com reports. Coach Mike Tomlin said Tuesday that Boswell will be forced to compete for his role as the Steelers' kicker over the next few days as the team holds an open tryout, Chris Adamski of TribLive.com reports. "He will be given an opportunity to play his way into this game [against the Patriots] this weekend," Tomlin said. Boswell made all three extra-point conversions but missed both his field-goal attempts during Sunday's 24-21 loss to Oakland. Analysis: Boswell's struggles have been legendary; he's missed three of his last five field-goal tries and six of 16 this season. He missed a 39-yard attempt -- his first miss inside of 40 yards this season -- then lost his footing on a potential game-tying 40-yard kick that was blocked. If he is still kicking for the Steelers in Week 15, he'll face the Patriots, who allow kickers an average of 7.3 fantasy points per game. Boswell made his only field-goal attempt (48) and converted three of four extra-point attempts during Sunday's 33-30 loss to the Chargers. 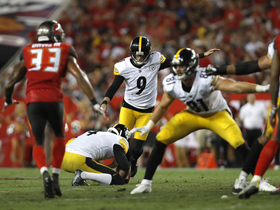 Analysis: The field-goal was just Boswell's 10th of the year, tied for second fewest for a team this season, and he has now missed four extra-point attempts this season -- more than in his previous three seasons combined. He should get plenty of opportunities in Week 14 against Oakland, which allows the second most fantasy points to kickers per game (8.6). Boswell made one of two field-goal attempts (41) and converted both his extra-point attempts during Sunday's 24-17 loss to Denver. Boswell made both his extra point tries during their 20-16 win against Jacksonville. Analysis: Jacksonville did a good job against the potent Pittsburgh offense, resulting in Boswell's worst outing this season and his lowest point total since Week 6 of the 2016 season. The offense should fare better against Denver in Week 12. Boswell made his only field-goal attempt (50 yards) and all seven extra-point tries during Thursday's 52-21 win over Carolina. 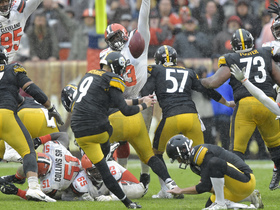 Analysis: This season has been one Boswell would surely like to forget, but he was perfect in Pittsburgh's blowout win, including connecting on his longest field goal of the year. Week 11 has him facing a Jacksonville team that allows opposing kickers 9.3 points per game, third worst in the league. Boswell made his only field-goal attempt (29 yards) and two of three extra-point tries during Sunday's 23-16 win over Baltimore. Analysis: His streak of perfect games ends at two, and he has missed at least one attempt in five of eight games this season. Despite all the offensive weapons, Boswell is averaging just five points per game and faces the Panthers - who yield the third fewest points per game to opposing kickers - in Week 10. Pittsburgh Steelers kicker Chris Boswell drills a 48-yard field goal late in the fourth quarter. 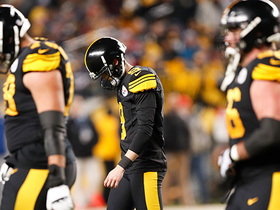 Pittsburgh Steelers kicker Chris Boswell misses a 32-yard field goal. 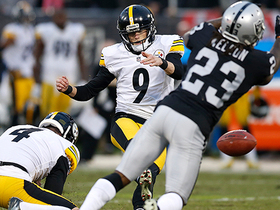 Pittsburgh Steelers kickers Chris Boswell misses a 39-yard field goal attempt. 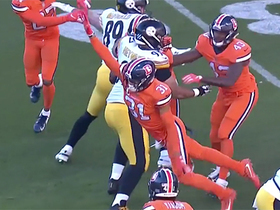 Denver Broncos safety Justin Simmons leaps over the line to block Pittsburgh Steelers kicker Chris Boswell's field goal. 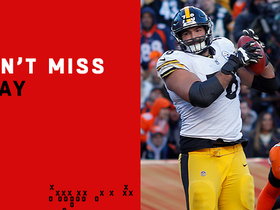 Pittsburgh Steelers kicker Chris Boswell misses extra point after tight end Vance McDonald touchdown. 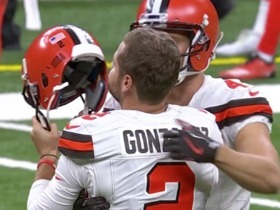 Pittsburgh Steelers kicker Chris Boswell kicks a hope-to-be game-winning 42-yard field goal but goes too wide in overtime against the Cleveland Browns.